If it’s been awhile since you’ve read the first two novellas in this series, I recommend checking out my reviews for Legion and Legion: Skin Deep before delving into this one. I know I needed the refresher before I tucked into this book. Stephen Leeds is back, and so are his aspects. Ivy, J.C., and Tobias are still front and center, but a few others come in to play over the course 105 page novella. Personal faves were Lua and Jenny, an all new aspect intent on harassing Stephen as she follows him and writes down every bit of his adventures. His own personal biographer, all in his head! In this story, Leeds and Co., are on the hunt for the elusive Sandra, who recently texted Stephen a single word: Help. Leeds panics. Sandra hasn’t contacted him in years, and now she reaches out in apparent distress? His anxiety is through the roof, and Ivy and J.C.’s distrust of the situation does nothing to help. But that’s what Tobias is for. To make matters worse, Leeds is losing control. Two of his aspects have disappeared, turning into Nightmares. Spectral/undead versions of themselves, intent on harming Leeds and his remaining aspects. Turns out, his personas can kill one another. And that’s a painful lesson to learn. This lack of control only ups the stakes for Stephen. He has to find Sandra. She was the one that helped him gain control in the first place, maybe she can help him again. But as the hunt continues Leeds begins to question who and what is real, and whether the price of ‘normal’ is really worth it. I have a lot of warm fuzzy feelings for this story. It’s the first Sanderson book I’ve read in quite a while, and it really reminded me why I love him so much. It also struck a resonant chord in me, because Legion is a very personal story for Sanderson and it really showed in this novella. Leeds is a man with voices and characters in his head. People as real as the neighbors you wave to each morning or the barista who hands you your coffee when you’re running late to work. And that’s how it feels to be an author. You create these people, often times without really meaning to, and they are suddenly vibrant and demanding and so much more real than you ever anticipated. The end of this novella actually brought a tear to my eye. And while that’s not unheard of for Sanderson stories, I definitely wouldn’t say I expect to get emotional from his books. This was a bittersweet tear, a feeling wholly satisfied and melancholy. I know Sanderson is widely admired for his giant works of fantasy. Books like Mistborn, The Stormlight Archive, Elantris, and Warbreaker. And they are wonderful. I love them all. But man, I think he’s actually at his best when words are at a premium. All three Legion novellas were powerful in their own way, and let’s not forget the Hugo award-winning The Emperor’s Soul. 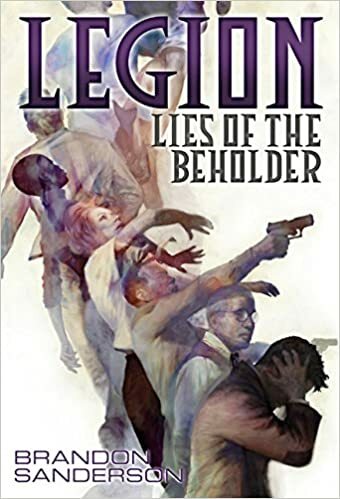 Legion: Lies of the Beholder is available in a few different formats. As a standalone e-book and in a hardbound collection of all three novellas called Legion: The Many Lives of Stephen Leeds. This is the copy I read courtesy of the library, and will eventually purchase, once we catch up from our expensive vacation. The cover art is phenomenal, and even better are the ink-blot chapter illustrations that change over the course of the series. I was impressed with this book overall. Can you tell? I was impressed with the clever plot, and the depth of emotion Sanderson put into so few pages. I was impressed with the book design, both for the cover and the interior and would greatly recommend the series to fans of detective stories with a slight Sci-Fi spin. I’m making good progress on War for the Oaks, and am optimistic that I’ll be able to review it next week. After that I’ve got a few more Urban Fantasy novels queued up, so we’ll see what strikes my fancy.